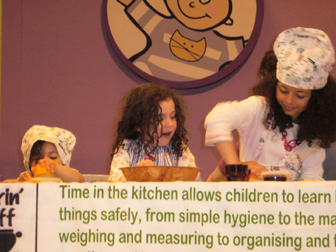 Stirrin' Stuff works in partnership with schools and nursery schools as well as at food events throughout the UK. 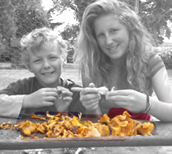 Children have fun cooking from scratch for healthier diets and a greener environment and teachers and parents get added value too. A resource for grown ups; an inspiration for children. 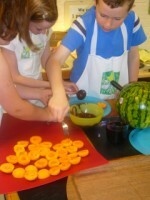 Children love being involved with food and it has great potential for fun and learning. Of course it takes a little longer and requires the careful supervision of younger children. Then of course there is the mess factor -in my opinion the real reason why Mum, Dad or Auntie Glad says No. I assure you that all of these problems are outweighed by the discovery that everyone will not only enjoy the food preparation but might even stick around long enough to enjoy eating it together. • Using your senses: taste, smell, texture and visible pleasure (or not as the case may be!) of your creations. Discernment of taste is something that you just can't get from eating most of the convenience foods that are on the market today. • Innovation and Creativity: - with confidence older children can learn to experiment by the substitution or addition (more maths) of ingredients. Simple recipes: begin with easy recipes using ingredients that you know your child will enjoy eating. I have found that there is a far greater chance that my lot will eat something for supper when they have been involved in it's preparation -they know what's gone in to it so we avoid," What's this?!". Make your kitchen child friendly: Stools are useful for younger children to enable them to reach work surfaces. Begin with clear surfaces - children need more space than adults. Have everything ready before you start and encourage clearing up as you go along. The Stirrin' words are "Be Prepared". Scrap Book: Let your children write the recipes up in their own fashion using instructions that they understand. It doesn't matter if it's unconventional this is their cookery Book. They could stick grains, pasta shells, labels or pictures from magazines in - anything that encourages them to get cooking! 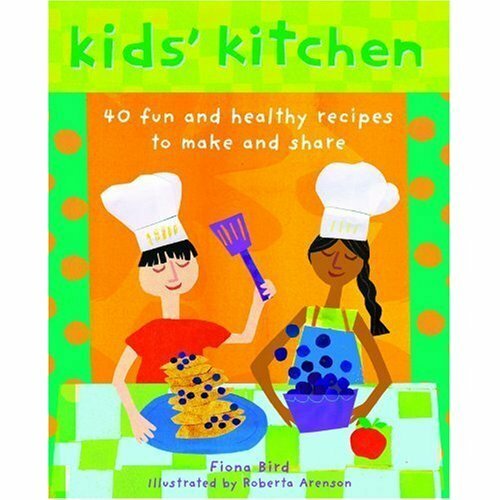 Fi's "Kids' Kitchen" cookery cards are now available from Barefoot Books (click here). The 40 delicious and nutritious recipes are displayed on laminated, wipeable, full-colour cards, all stored in a sturdy box. Also contains a booklet with key food facts and guidelines on kitchen safety. 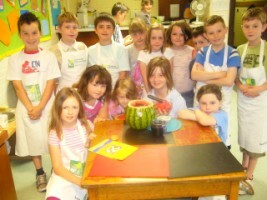 "Fi Bird is the most enthusiastic teacher in the world and she's on a mission to get children cooking. No surprise then that her Kids' Kitchen recipe box is practical, affordable and never patronising. Every child should have one."